Weighty Matters: If Your Kids Hated Apples, Would you Feed Them Apple Pie? If Your Kids Hated Apples, Would you Feed Them Apple Pie? What a great line! Credit goes to Ann Cooper of Chef Ann, and it was included in the New York Times' recent piece on the controversy surrounding schools and chocolate milk. 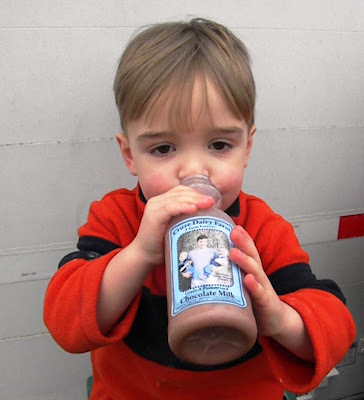 Chocolate milk's a liquid chocolate bar and should be consumed as a treat, not as a staple. The "milk's got magical nutrients that make the calories and added sugars not scary" camp thinks that calcium and vitamin D are so important and kids are in such dire bone straits that they need to be coerced by sugar into drinking a beverage that we adults used to drink without a fight (probably because chocolate milk wasn't an option). What boggles my mind is that despite the terrifying growth of childhood obesity and the absence of any robust, credible, tangible, evidence based long term negative consequence to kids not drinking huge amounts of milk (let alone chocolate milk), it seems that my camp's the minority. I read an article last week about pushing milk hard in the Hamilton Spectator. It was written by registered dietitian Vicki Edwards who works for Hamilton's Public Health Services. "Milk is a healthy beverage choice and is especially important for your calcium and vitamin D on a daily basis. But surveys show that both teens and adults are not consuming the recommended number of Canada Food Guide servings of milk and alternatives for good health. Adding chocolate or other flavourings to milk can enhance the taste and encourage more milk consumption. Chocolate milk contains about the same amount of sugar as unsweetened juice. And almost half of that is the naturally occurring sugar, lactose, which is also found in white milk. And chocolate milk is a more nutritious replacement for other sweetened beverages such as pop, fruit beverages and sports drinks." So Vicki, I'm assuming you know this, but in case not, the reason juice isn't sweetened with added sugar is because natural juice naturally contains a tremendous amount of sugar- 5 teaspoons a glass - which is one of the reasons why the American Academy of Pediatrics and the Canadian Pediatric Society recommend that kids 6 and under have a maximum 125mL of the stuff and that everyone else cap themselves at 250mL. Consequently, your statement comparing chocolate milk to juice does two public disservices. Firstly it encourages the consumption of more chocolate milk and secondly it suggests juice is a healthy beverage with no consumption limits. In terms of the the nutrition of chocolate milk - you cannot look at foods and evaluate them on the basis of specific nutrients while ignoring others. Were Coca Cola to create a beverage with the same amount of protein, calcium and vitamin D as chocolate milk, I'm fairly certain you wouldn't be encouraging its consumption. Of course that'd be a shame because were there such a beverage it'd likely be a healthier choice than chocolate milk given that chocolate milk contains 80% more calories drop per drop than Coca Cola, and in case you hadn't heard, childhood obesity's a bit of a problem here in Canada. So please Vicki, while I know I'm giving you a hard time here, the circulation of the Hamilton Spectator is 105,160, and I think you owe it to them to ensure that the recommendations you make are in fact nutritionally sound, and while we're certainly entitled to disagree, I'd love to see the evidence base that would support the ad libitum consumption by children of a beverage that has 80% more calories drop per drop than Coca Cola simply as a means to provide them calcium and vitamin D.